This is not a Photoshopped picture. These are Mangalitsa pigs (also spelled Mangalitza and Mangalica). They really do have curly, sheep-like wool. They were developed in Hungary in the nineteenth century by cross-breeding local swine with Serbian swine to create a fattier, easily kept pig. Since WWII, fatty pork has gone out of style and the herds have dwindled to just a few thousand in the Balkans and Hungary. A closely related British, curly-haired hog went extinct in the 1970s. Many foodies think the trend toward leaner pork has gone too far, with modern pork becoming a dry, flavorless meat that requires brining or cooking in liquid to bring out the flavor. Re-enter the woolly pig. 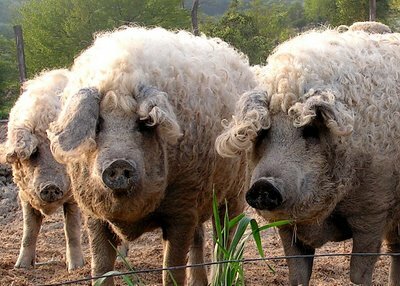 Several British and American farms have imported Mangalitsas and begun selling the pork through farmers' markets and gourmet outlets much to the joy of pork lovers. Since they are also terribly cute, I imagine Mangalitsas will soon show up as exotic pets. Even if they were not cute or tasty, there would be value in keeping a herd here and there to maintain genetic diversity.